Technology is growing day by day, more than 2 types of solar panels are available out there in the market, but here we are going to discuss about two major types of solar panels which are widely used in India. Above mentioned two types are widely used in our country, particularly Polycrystalline solar panels are widely used in roof top solar panel installations. This type is smaller in size compared to polycrystalline solar panels, but more energy efficient than poly crystalline panels. 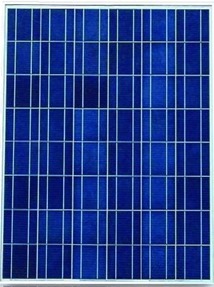 More expensive than Polycrystalline panels, this is why most people opt in for poly crystalline panels to cut the cost. Even though mono crystalline panels are energy efficient than poly crystalline, solar tracking system is needed to get the full potential of mono crystalline panels. Solar tracking system moves the solar panels in right angle according to the movement of sun light to maximize the power production. But it is very expensive and budget conscious people always don’t prefer to invest more money on this thing. Mono crystalline panels withstand high temperatures and function well, whereas poly crystalline panels drop their efficiency at high temperatures like 45 degree Celsius or above. But it is not a problem so far, poly crystalline modules perform well under Indian tropical weather conditions. Different manufacturers give different kind of warranty for PV modules, according to the build quality of the panels and Price. Normally manufacturers give 25 years warranty for Mono crystalline panels, but a perfectly made mono crystalline panel would last for more than 25 years. For Poly crystalline panels, manufacturers give warranty up to 15 years according to their pricing and quality. Buying Polycrystalline panels with long warranty is a wise decision as so many non-branded PV modules lose their efficiency in first five years itself. In such case warranty will help you get your panel replaced. Some manufacturers offer performance warranty on solar panels, which is more useful for buyers . Buy only branded solar panels from reliable dealers to enjoy long term performance. Mono crystalline solar panels are best for installations above 1000 watts. Poly crystalline panels are cost effective solution for rooftop installations like 100 watts to 1000 watts. It doesn’t mean that poly crystalline panels are not good for large installations. Energy efficiency difference between mono and poly crystalline panels is just around 2 %. Poly crystalline panels are improving day by day and the difference is very minimal, we recommend Poly crystalline solar panels for all kinds of solar panel installations. Buy only branded PV models, beware of factory rejected cheap PV modules in the market.